Decompression of the neural elements. Abolition of abnormal spinal motion. This involves removing bony, ligamentous or disc pressure on the spinal cord or its associated nerve roots. Occasionally it can involve the resection of tumours arising from either the spine itself or arising from distant sources such as the breast, skin, kidneys or thyroid. The most commonly performed decompressive procedures are a lumbar microdiscectomy done posteriorly or anteriorly, an anterior cervical discectomy, or a lumbar laminectomy or decompression. This is obviously a very attractive option to most patients and definitely to the marketing people in most spinal companies. Disc replacements have been available for some time and in the cervical spine the 10-year results are starting to show superior results to fusion. The same cannot be yet said for the 10-year results of lumbar disc replacement. The reasons for this are the massively different forces that exist within the cervical spine (neck) and the lumbar spine (low back). Equally, revising a broken or failed disc prosthesis in the neck is a relatively safe procedure due to the position of the major blood vessels and nerves. The same cannot be said for revision lumbar disc replacement which can on occasion be a near fatal operation. Fusion is performed for two purposes; 1) to abolish abnormal movement, 2) to restore and maintain normal posture. Ultimately, the fusion process results in two or more blocks of the spine becoming one. It is easy to get fixated on the screws, rods or cages used at the time of surgery, but more importantly it is the biology that allows the bones to effectively weld together. Historically, fusion has a bad reputation and this in part results from two factors; firstly, up until relatively recently very little concern was given to the position in which the spine was fused. In particular, the sagittal profile or side-on view of the spine was not really considered. This led to the transfer of stress to the mobile spinal segments above and below the area fused. 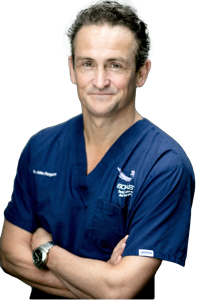 Since the early 2000’s, spinal surgeons have adopted a more sensible approach and now pay great consideration to the position in which each individuals spine should be fused. This needs to take into account the alignment of their entire body, and ultimately before a fusion procedure is performed, one should have an x-ray that goes from the hip joints to the cervical spine or neck. Whilst no data currently exists to prove that fusion in the correct alignment results in no greater stress on adjacent segments than say a disc replacement, there is certainly a body of basic science literature to support this convention, and in the setting of the lumbar spine at almost all levels a well-done fusion would be my preferred option to the currently available lumbar disc replacement devices. I hope this brief introduction is of some use to you. For more detail on disc replacement, fusion and decompression procedures, please see the more detailed segments of this website which describe the different techniques that may be used to obtain the desired result.